Photos, Books, China, Maps and more. For Atlantic City related items, please see our Atlantic City page. 1821. (photo) U.S. Life Saving Station, New Jersey c.1900. Very nice close view shows a Bibb #2-Type station from the back. This may be a New Jersey Station – have not confirmed as yet. Great clear view includes surfboat and carriage and other equipment. Note men in boatroom. Great image. (VG+). $54. 16191. Downey, Leland Woolley. Broken Spars - New Jersey Coast Shipwrecks 1640-1935. Brick Township Historical Society. First Edition. (1983). 75p. Soft wraps. In an effort to compile an authentic record of New Jersey shipwrecks, the author spent hundreds of hours examining the history of the shipwrecks and life-saving services along the New Jersey coast and presents it herein. Included are the causes of wrecks in the area, examination of many of the earliest wrecks, the Wreckmasters, the institution of life-saving services in the area, later shipwrecks from 1850-1935, and more. Also included are an appendix of alphabetical listing of shipwrecks, and appendix of chronilogical listing of shipwrecks 1705-1935. Illustrated with drawings, maps and vintage photos. A good source for the area. (VG+). $22. 15183. (set 6 copy drawings) U.S. Life-Saving Station, Delaware Bay, Cape May Point, Cape May County, NJ. Historic American Buildings Survey. 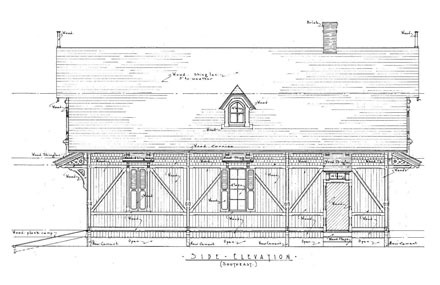 Great set of six architectural drawing copies measure 11” x 16 ½” and detail the four sides and two floor plans of the historic Cape May Point station. 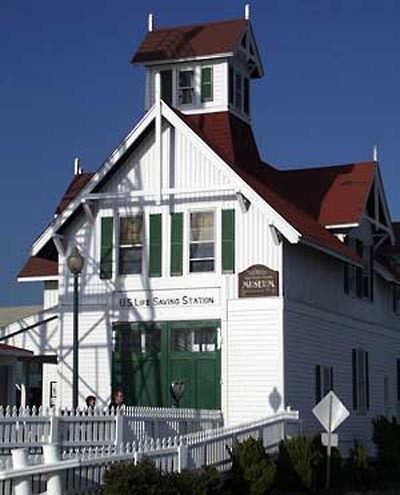 The station is a modified 1876-type and was constructed at the 1876 Philadelphia Centennial Exposition for the Life-Saving Service exhibit before being moved and rebuilt as the Cape May station. Great for research or display. 6 sheets. $22. 15270. (lot 2 photos) Deal Life-Saving Station at Asbury Park, New Jersey c.1885-1890. Nice lot includes crew photo c.1890 with men identified on back, and copy photo of the station in about 1885. This was one of the first four Deal-type stations designed by Paul J. Pelz. Photos measure 3 ½” x 4 ¼”. Good views. (VG). $42. 1397. 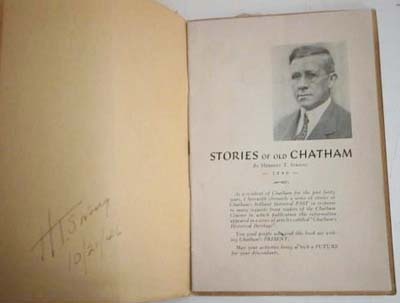 Strong, Herbert T. Stories Of Old Chatham (NJ). Chatham, New Jersey. 1946. 53p. Soft wraps. Autographed by the author, 10/21/46. Includes drawings, photos, maps, land, etc. A resident of Chatham since 1906, the author chronicles Chatham’s past in a series of short stories. Accounts include Geological History of Chatham, Indian Occupation, Pre-Revolutionary Days, Land Boom Begins, Washington’s Escape, The War Ends, Early Religious Life, History of Churches, Earky School Days, Early Transportation, Early Storekeepers, Free Public Library, and more. Clean, tight in somewhat worn and spotted soft wraps. (VG-) $16. 1670. (photo) Coast Guard Radio Station, Cape May, NJ. c.1938. 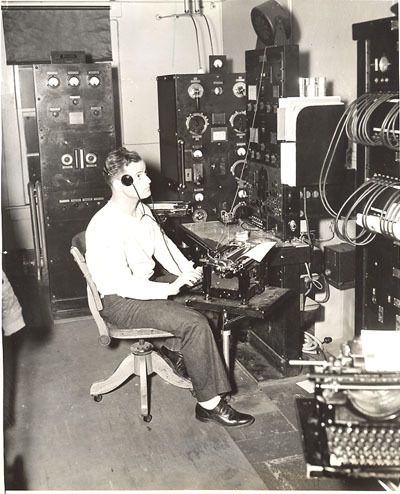 Clear, close original 7” x 9” press photo shows great detail as Radioman Steven Brodnan at Cape May receives SOS calls that send the Coast Guard “Winged Mercy”, the largest flying boat ever built for Coast Guard Service, on its missions. Photo is b/w and includes date and description on back. Great view of early radio apparatus. Clear and close view. Dated March 12, 1938. (VG+). $38. 12307b. 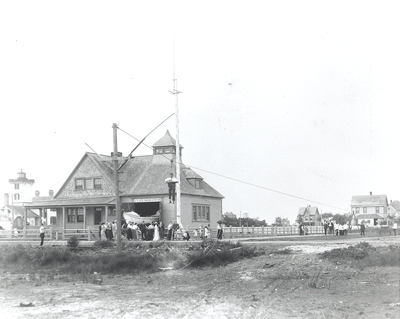 (photo) America’s First Life-Saving Station Built at Sandy Hook, N.J. in 1848. Clear, close original 8” x 10” Coast Guard press photo by J.J. Hinton, Pay Clerk (3) U.S.C.G., shows great detail of the rare station. In 1848, Monmouth County Congressman William A. Newell reported to Congress that 158 sailing vessels had been lost off the New Jersey coast between 1839 and 1848. Newell asked Congress to appropriate $10,000 to build eight “lifeboat stations” equipped with “surfboats, lifeboats, and other means for the preservation of life and property shipwrecked on the coast of New Jersey between Sandy Hook and Little Egg Harbor.” Congress agreed, and the stations were completed in 1849, spaced ten miles apart from Spermaceti Cove on Sandy Hook south to Long Beach Island. 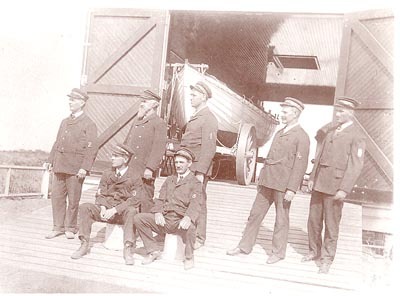 Each station housed rescue equipment that included a surfboat mounted on a wagon, a small line-throwing mortar, and a small enclosed metal lifeboat called a “lifecar.” The Life-Saving Service would expand into one of the most respected Government departments and in 1915 would merge with the Revenue Cutter Service to become the U.S. Coast Guard. In the short time that the service existed, they would be credited with saving over 200,000 lives. Rare photo is b/w and includes date and photographer’s blind stamp. Print dated February 15, 1931. Clear, close view, clean, crisp, great detail. (VG+). $54. 15115. 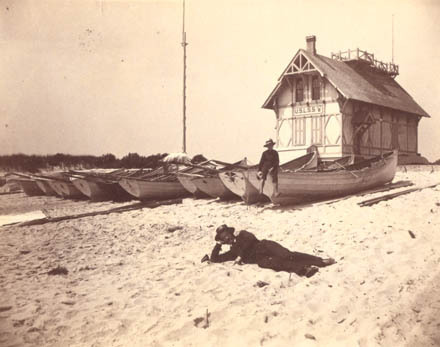 (photo) U.S. Life Saving Station, Ocean Beach, NJ c.1881. Clear close photo shows great detail of this early station, labeled as Ocean Beach, NJ. Measures 3 ¾” x 4 ¾” on remains of album page. Clear view. (VG+). $165. 15106. (photo) Barnegat Lighthouse Threatened by Storm c.1933. Clear, close original 7” x 9” press photo shows great detail as the 1858 Barnegat lighthouse is seriously undermined and threatened by the ocean in the storm of September 15-16. Photo is b/w and includes date and description. Dated September 17, 1933. Clear, close view, great detail. (VG). $54. 15181. Coyle, Gretchen F. and Deborah C. Whitcraft. Tucker's Island. Arcadia 2015. 128p. Soft wraps. With over 160 vintage photographs. 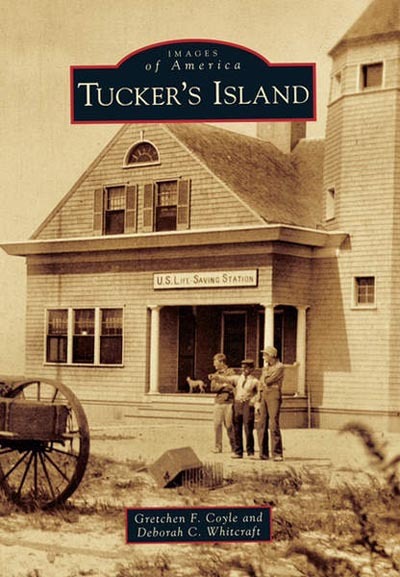 Once located between Great Bay and Little Egg Harbor, along the New Jersey coast, in 1932 Tucker’s Island disappeared into the Atlantic Ocean. Sand dunes and native foliage once covered its eight miles. For generations, the Rider family kept the lighthouse illuminated, and the US Life-Saving Service provided aid to ships in distress. Two hotels were constructed by island men with building materials salvaged from local shipwrecks. Visitors arrived by sail or steam, and the popularity of Tucker’s Island inspired real estate agents to sell worthless lots to unsuspecting buyers eager for their own piece of the shore. Over the years storms battered the vulnerable island and by 1927 the lighthouse toppled onto the sand. 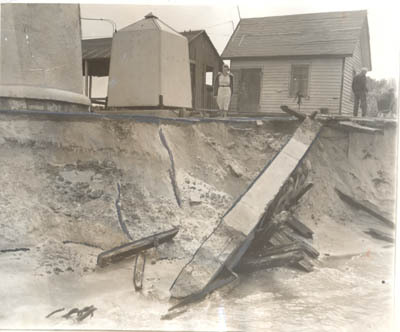 Soon the life-saving station washed away, and in 1932, the island was removed from tax records. This compact volume features numerous early photographs dating from the 1870’s through the 1920’s, drawn from the author’s and other private collections, most never before published, and traces the history of these services and the island through photos and text. Filled with early Life-Saving and Coast Guard views. (M). $21.99. 14300. 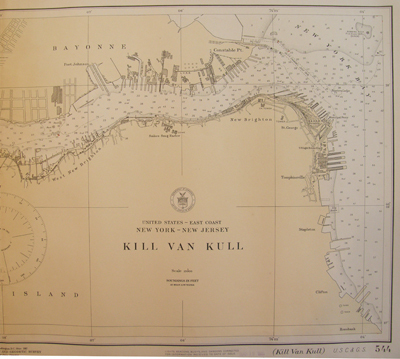 (chart) KILL VAN KULL New York-New Jersey #544. 1917. U. S. Coast and Geodetic Survey. 1:15,000. 16h” x 35w”. March 1921. 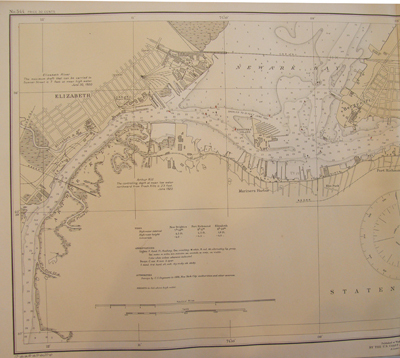 Bright, very large detailed original Coast Survey chart includes the waters Newark Bay and New York Bay, as well as Thompkinsville, Bayone and Elizabeth. 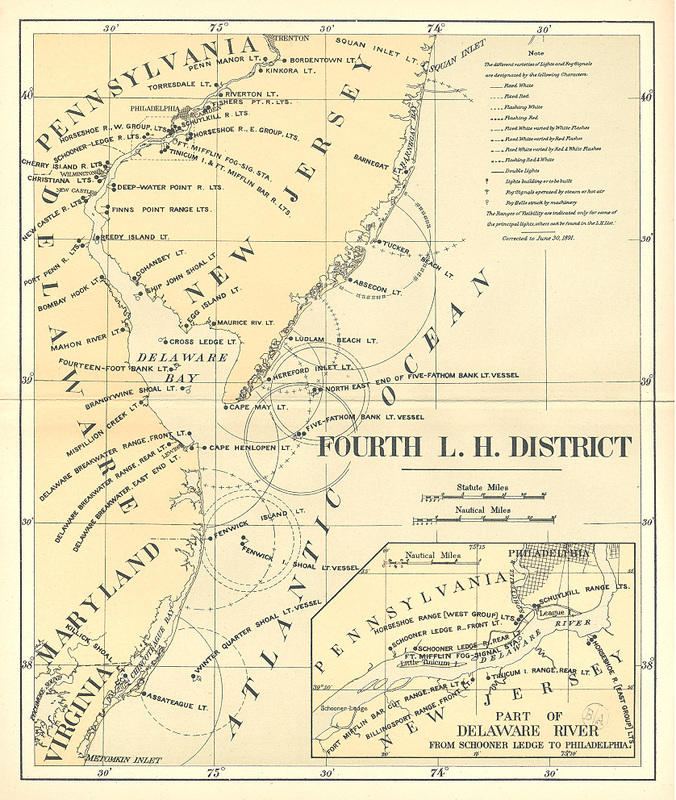 Chart includes the U.S Lighthouse Depot at Thompkinsville, as well as all lighthouses (Bergen Point, Robbins Reef, etc. ), buoys, towns and features and more. The area has numerous obstructions and is difficult to navigate. Included on the chart are bearings, tides and currents for the area, and soundings. Chart is in very good condition, only one light fold, overall clean and crisp. Perfect for framing for wall display. (VG+). $144. 14153. (photo) Lighthouse Service Radio Range Station, Newark, NJ. c.1938. 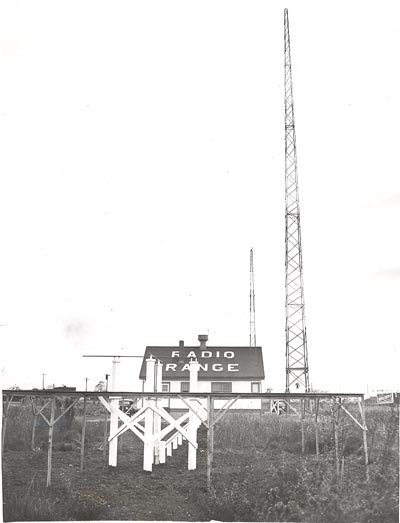 Clear close press photo shows great detail of the radio range station for Newark Airport. The “radio “beam”, through a series of dots and dashes, safely guides aircraft, especially in storms or fog. The Air Commerce Act of 1926, provided for the encouragement and use of aircraft in commerce, under the Secretary of Commerce. The Airways Division was set up as a part of the Lighthouse Service, and F.C. Hingsburg was appointed Chief Engineer, Airways Division. The Division installed and maintained light and radio beacons across the country to assist in aircraft navigation. Measures 8” x 10”. Includes description on back. Dated November 22, 1938. (VG+). $38. 13359. (photo post card) Bonds Life-Saving Station, New Jersey c.1888 view. Great image of Captain John Marshall (with beard) with his crew at the Bonds Life-Saving Station in 1888. View includes the crew posing in front of the station boatroom and surfboat. Great image on recently published photo card. 5” x 6 ½”. (F-). $10. 14134. 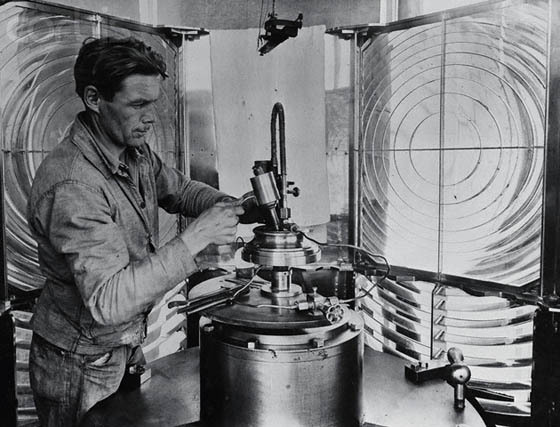 (photo) Using Radio Bearing Compass, Coast Guard Station Cape May, NJ. c.1938. 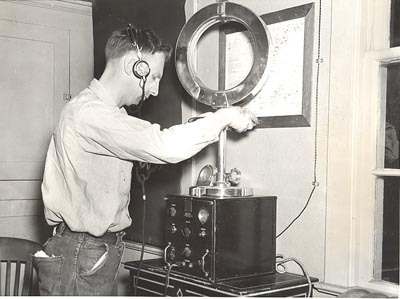 Clear, close original 6” x 8” press photo shows great detail as Radioman Gene Klarman at Cape May tests the Radio Bearing Compass, used for ascertaining the precise location of a ship in distress. Photo is b/w and includes date and description on back. Clear and close view. Dated March 12, 1938. (VG+). $28. 14205. Rappleyea, George W. An Old Timer Brings You Down The Jersey Coast. Motor Boating. October 1938. Full issue. Wonderful six page article looks at the work of the Coast Guard along the New Jersey coast over the years. The author includes a bit of the history of the service from the first stations of the Life-Saving Service, storms and rescues, some of the equipment including the new 80-foot patrol boats, the 50-foot motor lifeboat Invincible, and more. Full issue included numerous other boat and yachting articles, and wonderful advertisements of the day. Well illustrated with six photos. Overall clean, only light wear. (VG). $42. 14110. (stereoview) Early U.S. Life-Saving Service Station, Atlantic City, NJ c.1870. 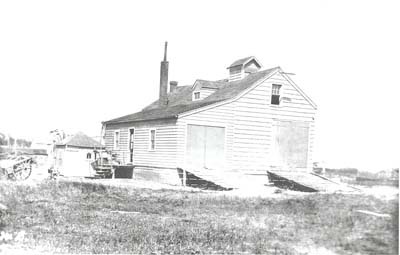 Rare early view of the early 1871 Red House-Type life-saving station built in 1872 near the lighthouse, seen behind the station, in Atlantic City. This station replaced the earlier 1855 style station. The station was 42 feet long and 18 feet wide and included a second story for storage and sleeping quarters for the crew. Note too the ladder and walkway to the roof peak for observation and signaling. This station was replaced in 1884. Rare early view as few images of this style station remain. On orange mount, cracked in center which affects edge of one image. Light foxing. (G). $68. 13436b. 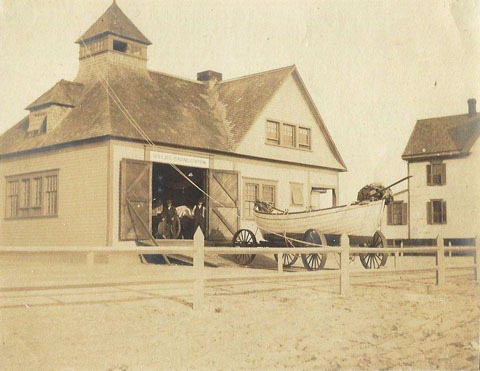 USCG- USLSS Surf Boat Station, Two Mile Beach, Wildwood, NJ c 1920. Close view of the classic 1872 New Jersey red house-type station from the side. More boats and equipment and a need for better housing led to the expansion on one side. Unusually clear, close glossy b/w 8” x 10” copy photo was printed photo-chemically (not digitally scanned) from an original photo or negative and shows great detail of the station and out-buildings. Nice view. $22. 13436. USCG- USLSS Surf Boat Station, Two Mile Beach, Wildwood, NJ c 1920. Close view of the classic 1872 New Jersey red house-type station with an addition to one side. More boats and equipment and a need for better housing led to the expansion on one side. Unusually clear, close glossy b/w 8” x 10” copy photo was printed photo-chemically (not digitally scanned) from an original photo or negative and shows great detail of the station and out-buildings. Nice view. $22. 13456a. 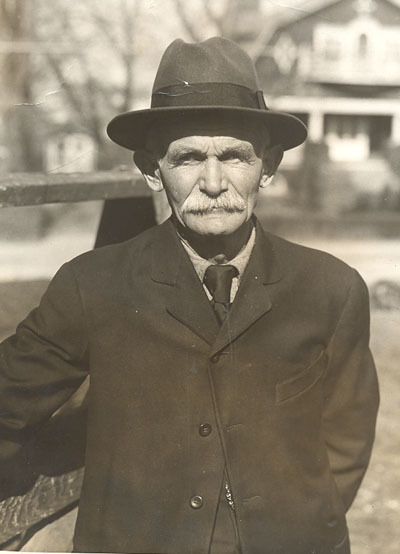 (photo) Captain Ole Anderson, Principal Keeper (1906—1928), Highlands of Navesink Twin Lights, New Jersey c.1929. Clear, close, original 6” x 8 ½” press photo shows excellent detail of Keeper Ole Anderson, 65, who is retiring after 35 years as a lighthouse keeper. Most recently he had been keeper at the Navesink Twin Lights. In retirement he chose to live near his former station – just so he will not “miss the inspiration of the beacon”. He began his life as a sailor on square riggers and had a master’s license to sail vessels “on any ocean”. Wonderful photo of the inspirational gentleman. Photo is b/w and includes date and description on back. Dated March 26, 1929. (VG+). $56. 13456b. (photo) Captain Ole Anderson, Principal Keeper (1906—1928), Highlands of Navesink Twin Lights, New Jersey c.1929. Clear, close, original 6” x 8 ½” press photo shows excellent detail of Keeper Ole Anderson, 65, who is retiring after 35 years as a lighthouse keeper. Most recently he had been keeper at the Navesink Twin Lights. In retirement he chose to live near his former station – just so he will not “miss the inspiration of the beacon”. He began his life as a sailor on square riggers and had a master’s license to sail vessels “on any ocean”. Wonderful photo of the inspirational gentleman. Photo is b/w and includes date and description on back. Dated March 26, 1929. (VG+). $56. 13209. 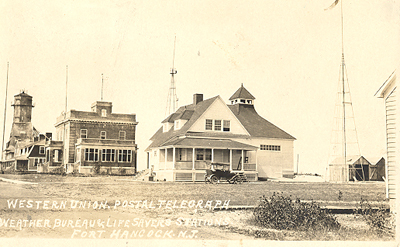 (photo) Sandy Hook Life-Saving / Coast Guard Station, Weather Bureau and Postal Telegraph, Fort Hancock, NJ c.1926. Nice clear view of the Bibb #2-type Life-Saving station and surrounding government buildings. The station was built in 1890 and watched over the busy sea lanes at the southern approach to New York Harbor. View measures 3 1/2” x 5 ½” on postcard paper. Clean, clear view. (VG+). $68. 1427. (mounted photo) Keeper With Crew, Harvey Cedars Life-Saving Station, New Jersey c.1890. Early close clear mounted photo provides a good view of the crew posing beside the station. 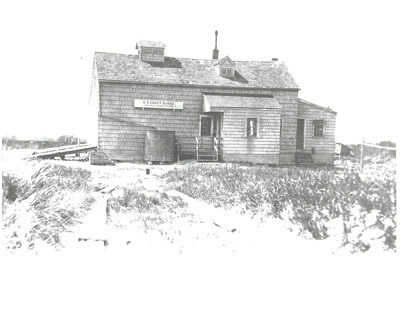 This may be the 1872-type station or the 1901 Duluth-type station, south of Barnegat Inlet, depending on the exact date. 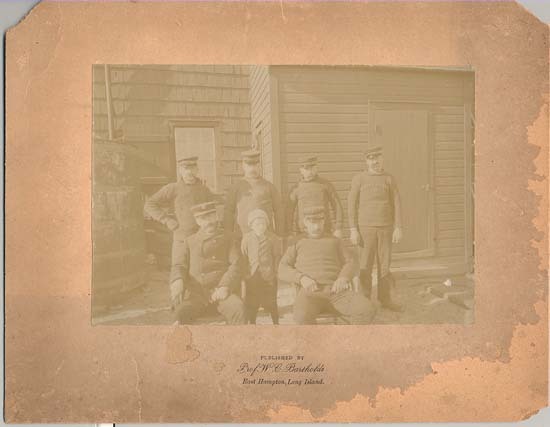 The six men can be seen posing with a young lad, possibly the Keeper’s son. To the left can be seen the station water cistern. 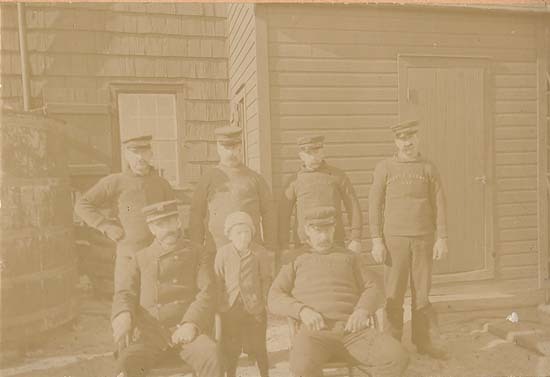 The men are wearing their sweaters lettered “Harvey Cedars LSS”. Photo itself is quite clear and crisp, on original tan mount. Mount has some missing corners and some moisture damage, which does not affect the photo. Photographed by Prof. W.C. Barthold, East Hampton, Long Island. Great early detail. 4 ½” x 6 ½” on 7 ½” x 9 ½” mount. (VG). $155. 12147. Baker, Kimball. “For Those in Peril”: A History of the Ocean City Life-Saving Station. 2011. Ocean City. 40p. Soft wraps. 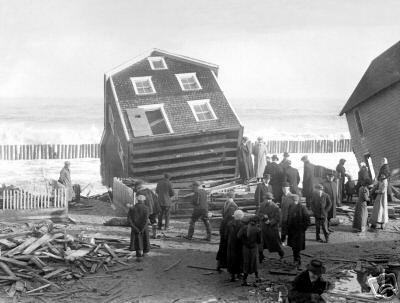 This story of the Ocean City Life-Saving Station is twofold: the story of the station and its rescuers, and the story of those who, through vision and perseverance, saved this important piece of our history from the wrecking ball. This 40-page, illustrated booklet provides both histories, and invites you to take part in making the rest of the story. A special feature of the booklet is a chronology of station-saving events, beginning with the listing of the property for sale in August 1998 and leading to the station’s restoration phase. Also included: an acknowledgement of those who rallied to preserve this beautiful station on site, and a chart with much information about its U.S. Life-Saving Service rescuers. Interesting account of the 1871 Red-House Type station and the later 1882-Type stations. (M). $10.95. 12315. 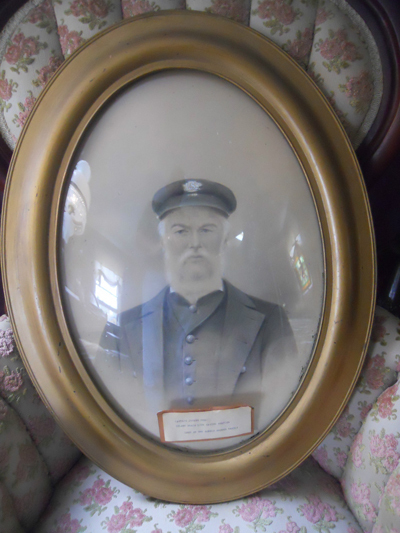 (framed portrait) Keeper Joseph F. Reed, U.S. Life-Saving Service, Island Beach Station, NJ., c.1870-1880. Lovely early hand-colored portrait, possibly from photo, of Keeper Joseph Reed of the Island Beach Life-Saving Station, New Jersey on Barnegat Bay. 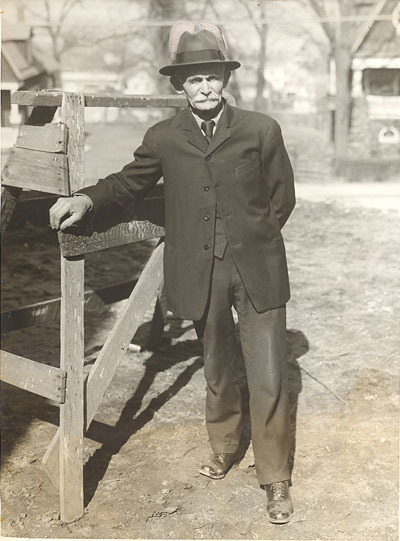 Joseph Reed was appointed Keeper of the Island Beach Life-Saving Station #14 in on December 30, 1870 and served until his death on March 15, 1895. The station was an 1871 Red House-Type station, built in 1872. Portrait is early as Reed is pictured without uniform, with early style home made “LSS” insignia on kepi-style cap. Portrait measures 13 ½” x 19 ½” oval, in period 2 ¾” wide gold painted oval wood frame fitted with striking early convex glass. Overall measures 24" x 18". 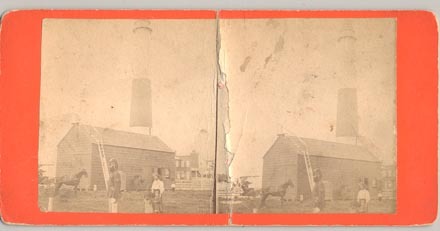 A paper label on the back notes: "Captain Joseph Reed, Island Beach Life Saving Station, lent by the Robert Brower family". The photo was loaned for display in an area museum in the 1960's. Rare early Life-Saving piece. No real issues other than a bit of cleaning needed. (VG). $445. 12359. (commemorative dish) c.1899. Exquisite bright, detailed pin dish features a detailed b/w image of “U.S. 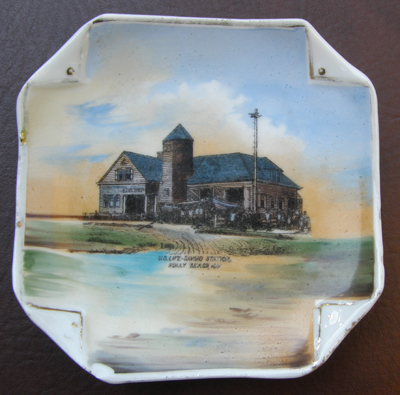 Life-Saving Station, Holly Beach, NJ.” Dish measures 5 ¼” square with clipped corners and provides a striking contrast to the large detailed image. Striking image is hand-colored and measures a full 5” wide, featuring the crew standing in front of the New Jersey Pattern-Type station built in 1899. Unmarked, dating it before 1899. Very attractive piece, only some wear to gilding. (VG+). $54. 12305. (newspaper) Spring Storms Add Peril to Shipwreckers’ Toil. New-York Tribune. April 18, 1915. 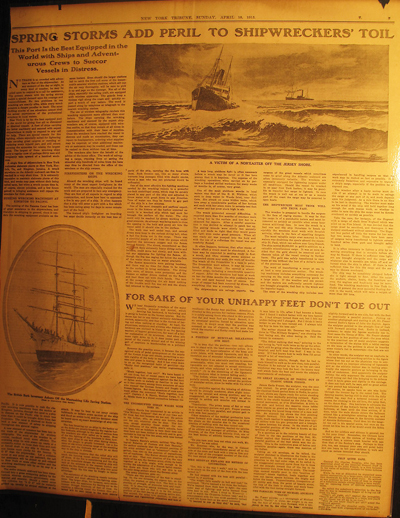 ¾ page article looks at the life of the shipwrecker along the Atlantic Coast. Unlike the “wreckers” of old, these shipwreckers are called upon in emergencies, in any weather, to aid vessels damaged or in distress, to salvage the vessel or its cargo, to pull her off bars and much more. Lengthy account looks at the lives and work of these men of the sea. Includes two photos of the British bark Invermey ashore near the Mantaaking (Mantoloking) Life-Saving Station on New Jersey’s Barnegat Bay, and a steamer foundering along the coast. Excellent reference and reading. Full page has been encased in plastic for protection. (VG). $32. 12209. (lot 2 photos) Keeper Frank Adams, Absecon Light Station, NJ. c.1914. 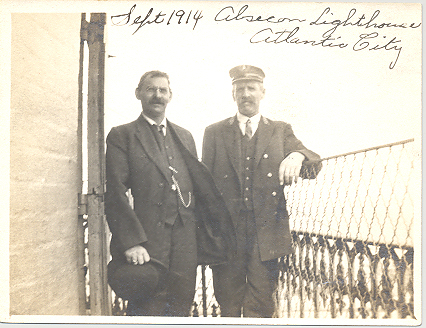 Rare dated photo shows lighthouse keeper on the balcony with second gentleman, possibly the District Inspector. This may be 1st Assistant Keeper Frank Adams. Photo is dated September 1914. Photo measures 3 ¼’ x 4 ¼” and is clear and clean. Also includes second photo of ship ashore on the beach. (VG+). $48. 12307. 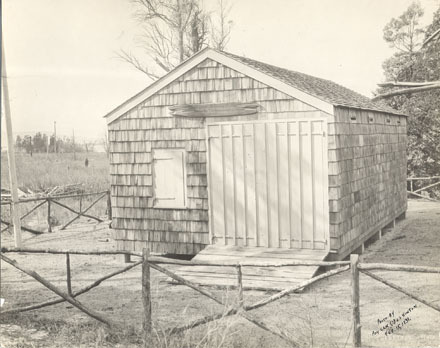 (photo) America’s First Life-Saving Station Built at Sandy Hook, N.J. in 1848. 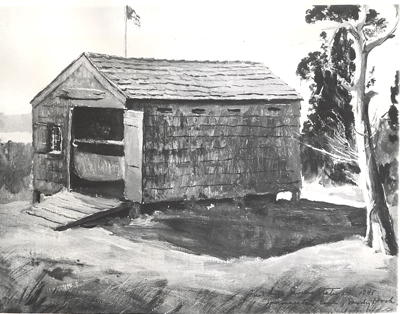 Clear, close original 7 ¼” x 8” Coast Guard press photo shows great detail of the station, as drawn by Chief Boatswain’s Mate William G. Lawrence, Coast Guard combat artist. In 1848, Monmouth County Congressman William A. Newell reported to Congress that 158 sailing vessels had been lost off the New Jersey coast between 1839 and 1848. Newell asked Congress to appropriate $10,000 to build eight “lifeboat stations” equipped with “surfboats, lifeboats, and other means for the preservation of life and property shipwrecked on the coast of New Jersey between Sandy Hook and Little Egg Harbor.” Congress agreed, and the stations were completed in 1849, spaced ten miles apart from Spermaceti Cove on Sandy Hook south to Long Beach Island. Each station housed rescue equipment that included a surfboat mounted on a wagon, a small line-throwing mortar, and a small enclosed metal lifeboat called a “life-car.” The Life-Saving Service would expand into one of the most respected Government departments and in 1915 would merge with the Revenue Cutter Service to become the U.S. Coast Guard. In the short time that the service existed, they would be credited with saving over 200,000 lives. Rare photo is b/w and includes date and description on back. Dated July 15, 1944. Clear, close view, clean, crisp. (VG+). $28. 12266. (copy photo) Hereford Inlet Life-Saving Station and Lighthouse, New Jersey c.1888 view. Copy photo measures 8” x 10” and is clear and quite close, providing an exceptional view of the entire station and crew as they drill with breeches buoy apparatus as throngs of Victorian visitors look on. To the left can ve seen the lovely Hereford Inlet lighthouse, and more. Rare view from original photo. (VG+). $24. 2558. Trapani, Robert Jr. LIGHTHOUSES OF NEW JERSEY & DELAWARE – History, Mystery, Legends and Lore. Elkton. 2005. 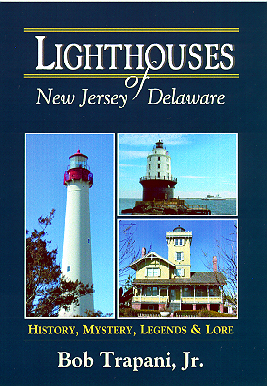 Lighthouses Of New Jersey & Delaware presents stories and photographs of 20 lighthouses along the New Jersey and Delaware coasts. From Sandy Hook, N.J., to Fenwick Island, Del., Trapani's stories feature unusual incidents associated with each silent sentinel. Shipwrecks and suicides, storms and fires, invasions of beetles and cats, and even a few ghost stories and legends are spotlighted in this easy-to-read collection of short stories. Using historical photographs, U.S. Coast Guard documents, newspaper articles and personal interviews, Trapani has created an informative and interesting book that shares an import part of the region's history and lore. Particularly interesting are the accounts if the keepers’ lives, their difficulties and efforts to make do. (M). $11.95. 1224. (copy photo) Fire Island Light Station, Assistant Keeper Gus Axelson Preheats Oil Gas Vapor c.1934. Crystal clear b/w copy photo shows Assistant Keeper Axelson preheating oil gas vapor before lighting the light. “On a lonely site on the Atlantic shore of Fire Island, stands the Fire Island Lighthouse, the guidepost to incoming transatlantic liners. Here, virtually isolated from the world, live the lighthouse keepers and their families, on duty every hour of the day and night. On them, to a great extent, depends the safety of thousands of marines and their cargoes. the above photo shows Gus Axelson, Assistant keeper, is shown preheating the oil gas vapor light before igniting it. Kerosene is used for the light as electricity and gas are undependable for the purpose. Axelson is using the pre-heating torch to light the mantle. The huge lenses that reflect the light are shown here on either side.” Acme Newspictures, Inc. photograph. Published December 18, 1934. 8” x 10” digital image. Clear, crisp. (F-). $20. 22245. Bailey, John. 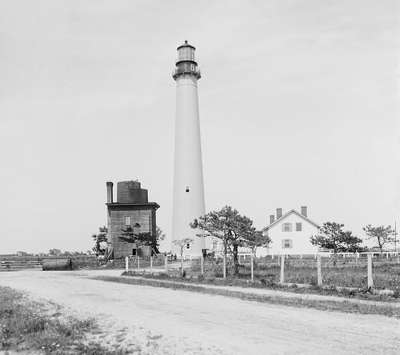 SENTINEL OF THE JERSEY CAPE – THE STORY OF THE CAPE MAY LIGHTHOUSE. Medford. 2001. 119 p. DJ. 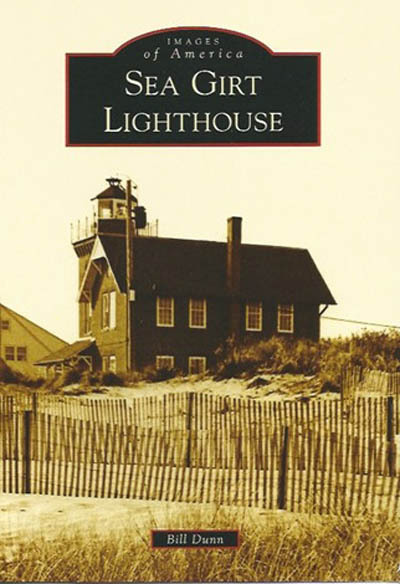 This historical account of the famous Cape May Lighthouse is an intriguing blend of historical observation and personal sentiment. 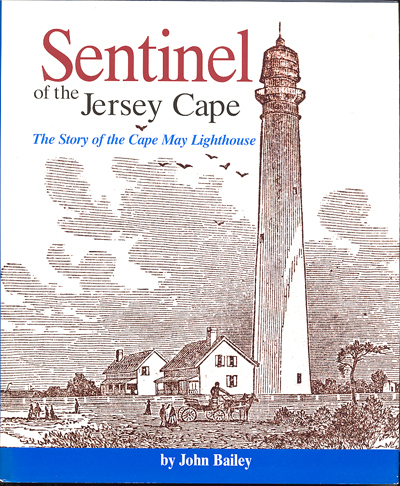 With its readable narrative, beautiful photographs, and nine appendices including Cape May Lighthouse at a glance: its chronology and geography, an inspection report from 1851, and a history of its keepers, this book provides both a fascinating history of the lighthouse and a glimpse into an era and way of life that has long passed. Includes a narrative of the towers and grounds, a section on the keepers, the station during the Coast Guard years, and much more. (M). Published at $22.95. Our price $21.45. 9230. Applegate, Lloyd R., A LIFE OF SERVICE: WILLIAM AUGUSTUS NEWELL. Toms River , NJ. 1994. 153p. Soft wraps. 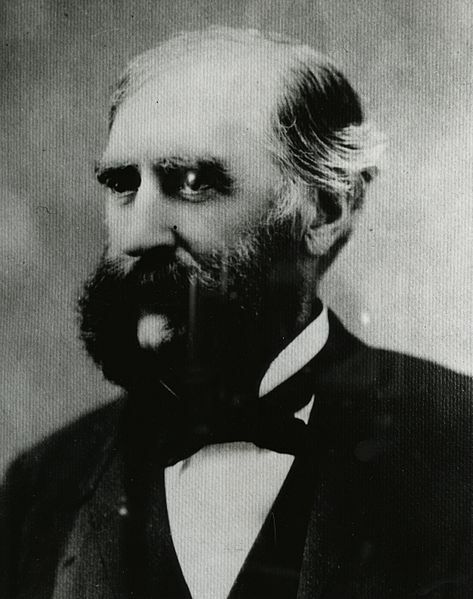 William Augustus Newell (1817-1901) founded the U.S. Life Saving Service by getting a $10,000 appropriation tacked onto the Lighthouse Bill of 1848. Newell was a physician/surgeon, three-term congressman from New Jersey , the first term being with Abraham Lincoln with whom he roomed, governor of New Jersey and later Washington Territory , White House physician in 1865, Indian agent in the Northwest in his 70's etc. For us, however, his extensive efforts in the establishment of the Life-Saving Service are of considerable interest and the author devotes fully one quarter of the book to these efforts, improvements in equipment and the memorial established by the New Jersey Legislature in 1896 commemorating his efforts. The only comprehensive account of the life’s work of this important figure. (F-). $19.95. 27349. (copy photo) Seabright Life Saving Station, New Jersey. Clear close copy photo shows the life saving station as it is washed into the sea. 8 ½” x 11” digital copy photo provides an unusually close view. (F-). $24. 27352. (copy photo) Deal Life Saving Station, New Jersey. c.1885 Clear close copy photo shows the life saving station in its early years. 8 ½” x 11” digital copy photo provides an unusually close view. (F-). $24. 27353. (copy photo) Stone Harbor Life Saving Station, New Jersey. c.1912 Clear close copy photo shows the lifs saving station with the crew assembled. 8 ½” x 11” digital copy photo provides an unusually close view. (F-). $24. 2589. Buchholz, Margaret Thomas. NEW JERSEY SHIPWRECKS – 350 Years in the Graveyard of the Atlantic. Harvey Cedars. 2004. 200 p. New Jersey Shipwrecks takes us on a gripping voyage through the “Graveyard of the Atlantic,” a name bestowed upon the state’s treacherous shoals and inlets. From the days of sail to steam and oil, ships (and even submarines) have been drawn to this coast and, for thousands of vessels, it became their final resting-place. Early rescuers braved the seas, rowing small boats, using simple buoys and rope to help the wreck victims. Quoting from original documents, letters and reports, Shipwrecks reveals the sense of duty and service which prevailed in these brave rescuers; many devoted their lives — literally — to help save the men and women whose own lives were turned upside down in stormy Atlantic waters. From the early wrecks of the 18th century to the present day, the life-and-death drama of maritime disasters is captured in Shipwrecks, along with the history of the U. S. Lifesaving Service (later to become the Coast Guard), lighthouses, legends, and true accounts of heroism. One hundred and forty-two historic photographs and illustrations are included in this large-format hardcover. 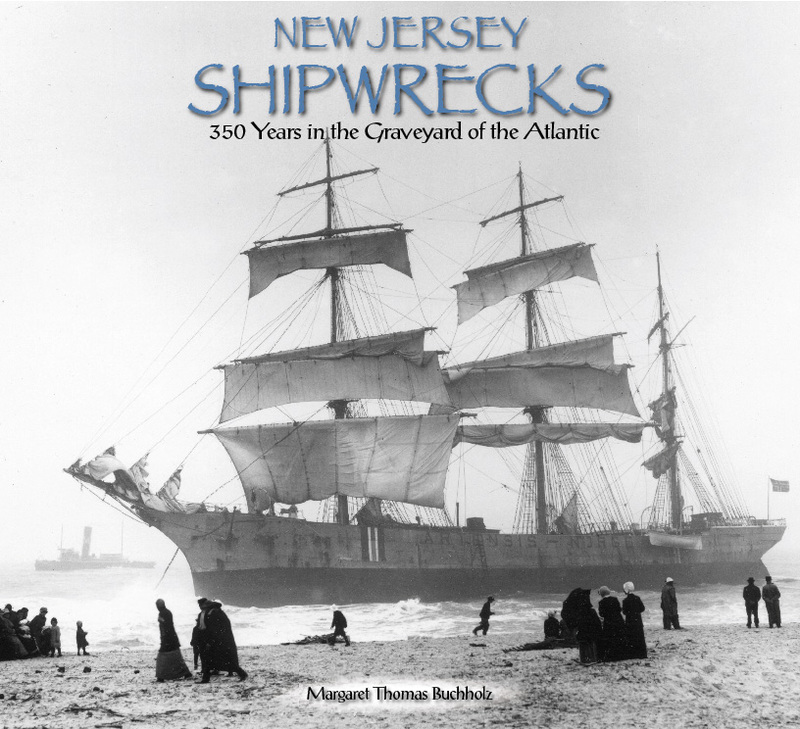 The book includes a listing of hundreds of other wrecks along the Jersey Shore. (M). Published at $44. Our Price $40.95. 22284. Von Ahnen, Katherine. MARY ELIZABETH AND THE CAPE MAY POINT LIGHTHOUSE. Cape May. 1990. 42 p. Soft wraps. Inscribed by the author. True story of a summer visit to Cape May lighthouse by Mary Elizabeth Bennett Rott, whose uncle Ed was Assistant Keeper there for over 20 years. Though this tale is not illustrated, it does provide an unusual insight into the summer life of the keepers there. (F). $38. 27467. 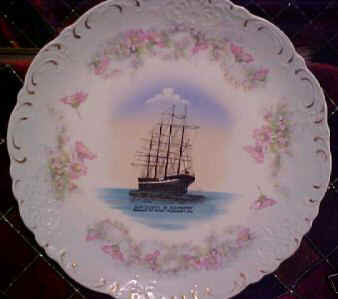 (commemorative plate) Ship “County of Edinburgh” Ashore at Point Pleasant, NJ. c.1900. Rare shipwreck souvenir china piece features a large, beautiful clear, detailed image of the ship “County of Edinburgh” ashore. 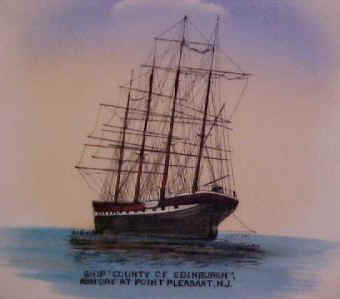 The British ship County of Edinburgh went ashore in a dense fog at about 10 o'clock at night on February 13, 1900 close to Manasquan Life Saving Station, on the Jersey coast, near Point Pleasant. The vessel drove on hard and fast and the life-saving crew deemed it best to remove the crew. Word was sent to the men at the Point Pleasant station, who hurried to aid the Manasquan crew. As it was impossible to launch the surfboat, a breeches buoy line was soon rigged and the crew removed. The superb, bright, floral decorated plate is quite rare and is one of the most attractive that I have had. This pretty display piece measures 8 3/8” in diameter and is enhanced by a decorative flowered border around the edge. Back marked “Wheelock China Made in Austria Vienna for Point Pleasant Hdwr. Co., Point Pleasant, N. J. Clean and bright, no cracks or chips, fine large detailed image. A fine display piece. (VG+). $245 net. 2804. 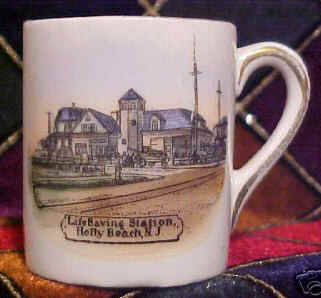 (souvenir cup) A rare, petite, gilt decorated commemorative cup featuring a beautiful clear, detailed color image of the “Life Saving Station, Holly Beach, NJ.” The superb cup measures 1 5/8” in diameter and is enhanced by a gilt decoration on the handle. The attractive detailed image includes a good look at the rare Jersey-Pattern Type station with the crew standing beside the surfboat on the station ramp. Nice detailed image on the white china make a good contrast on this rare little item. Marked “Wheelock Made in Germany for John N. Martin, Holly Beach, NJ.”. Clean, bright, a pretty display piece. Rare scene. (VG). $144 net. 29322. Seibold, David J. and Charles J. Adams III. SHIPWRECKS NEAR BARNEGAT INLET, LONG BEACH ISLAND, NEW JERSEY. Exeter House Books. 1995. 2nd. 92p. Soft wraps. An account of numerous wrecks and rescues in this notoriously dangerous stretch of Atlantic coastline. From the 1800’s up until the 1980’s, the author describes many of the more interesting of famous incidents. Scarce title. (VG+). $10. 9434d,g,h,j. Bachand, Robert G., NORTHEAST LIGHTS, LIGHTHOUSES AND LIGHTSHIPS - RHODE ISLAND TO CAPE MAY, NEW JERSEY. Norwalk , Ct. 1989. 422 pp. Impressive reference work covers 133 light stations that existed Includes all manor if information from construction information, major alterations and characteristics of the lights that existed there, to information about the keepers work there. A most excellent reference for this area, extremely difficult to find now. As new. (M). $52. 20264. 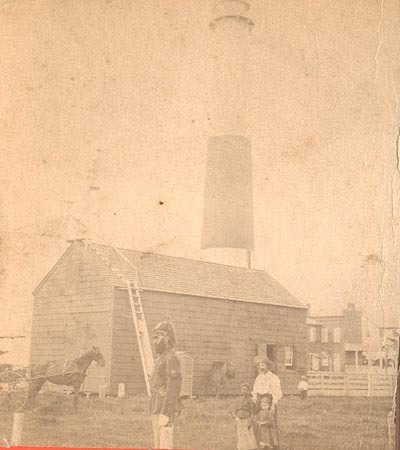 Veasey, David., GUARDING NEW JERSEY ’S SHORE - LIGHTHOUSES AND LIFE SAVING STATIONS. 2000. 127p. 200 vintage photographs. Published as part of the Images of America series by Arcadia Publishing. New Jersey ’s low-lying, sandy coast has been the scene of thousands of shipwrecks over the years as ships bound for New York foundered on its offshore shoals. Over 200 early photographs dating from the 1870’s through the 1940’s, drawn from the National Archives, Coast Guard and local museums document the state’s thirty-eight lighthouses and forty-one life-saving stations. In addition, former journalist Veasey weaves in his text the only history to date of the perils “Down the Shore”. A fine addition to your library. (M) $18.99. 25237. Quinn, William P., SHIPWRECKS ALONG THE ATLANTIC COAST – A Remarkable Collection of Photographs of Maritime Accidents from Maine to Florida . Beverly . 2004. DJ. 244p. Illustrated with over 260 photographs. News photographer Bill Quinn has been taking and collecting photographs of shipwrecks since he filmed the sinking of the Andrea Doria in 1956. For nearly half a century he has added to his remarkable archive, and his books represent some of the largest collections of shipwreck images in print. First published in 1988 and long out of print, Shipwrecks Along The Atlantic Coast has been reedited and redesigned for this new edition. The waters along the Atlantic Coast have claimed thousands of ships over the years. 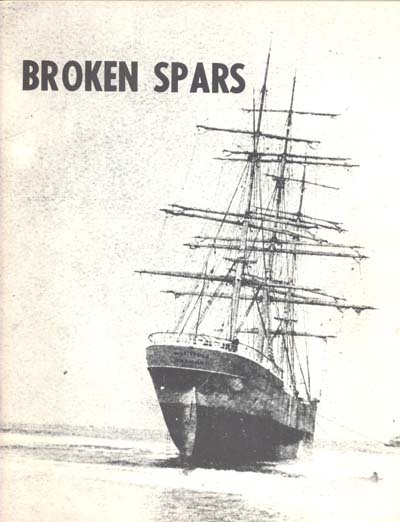 In this classic work, noted news photographer, historian and author Bill Quinn features hundreds of photographs of schooners and square riggers stranded, from the 1870’s to the 1980’s, from rock bound Maine down past the sandy shores of Cape Cod, through the sounds of Sandy Hook , New Jersey and on down the coast to Florida . With detailed text, the author describes numerous wrecks and the work of the Life-Saving Service and Coast Guard over the years. Notable wrecks Include the loss of the General Slocum, the City of Worcester , the Andria Doria, Normandie fire, Amerique fire, wrecks on the many sandy capes on the coast, Diamond Shoal Light Vessel No. 69, and many more. Exceptional vintage photographs and riveting reading. (M). $29.95 Our Price $21.95. 1119. (lot 3 documents) Lighthouse Keeper Pay Vouchers, Passaic Elbow Beacon (Lighthouse), Newark Bay, New Jersey c.1870. 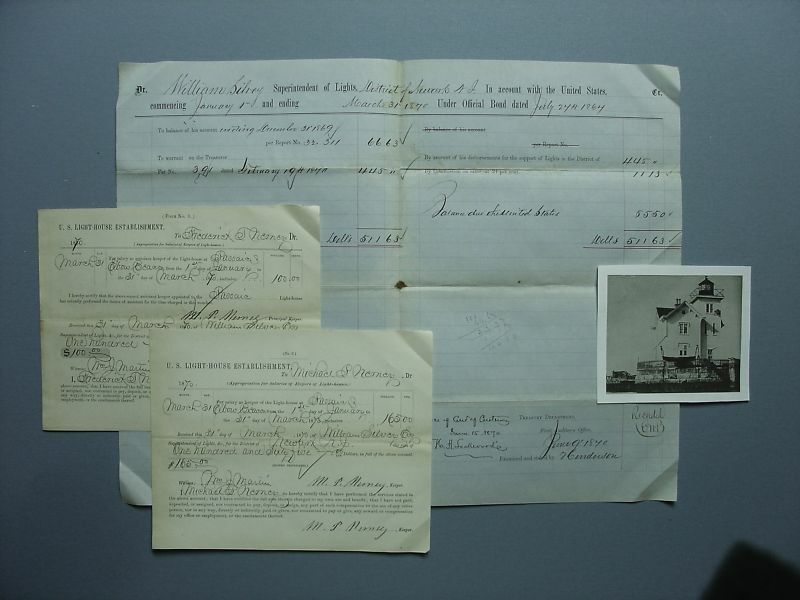 Two pay vouchers are dated March 31, 1870 and are filled out in hand by Keeper Michael P. Nerney and Assistant Keeper Frederick F. Nerney (brother ?). Michael P. Nerney was the first keeper at this light and was responsible for its establishment. Each document measures 6 ½” x 8 ¼” and is overall clean. Documents indicate the amount paid for the period January 1st to March 31st. and are signed in hand and witnessed. 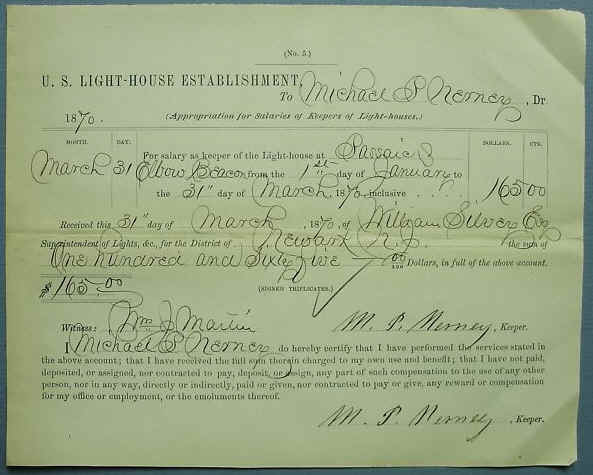 The third document is a large document, which is an account of William Silvey, the Superintendent of Lights for the District of New Jersey for keeper's pay for the same 1st quarter of 1870. This document is signed by H. A. Lockwood (who would have been appointed by President Benjamin Harrison as Deputy Commissioner of Customs). Document measures 13” x 16 ½” and is overall clean. Document indicates the amount dispersed for the period January 1st to March 31st and is signed in hand and witnessed. 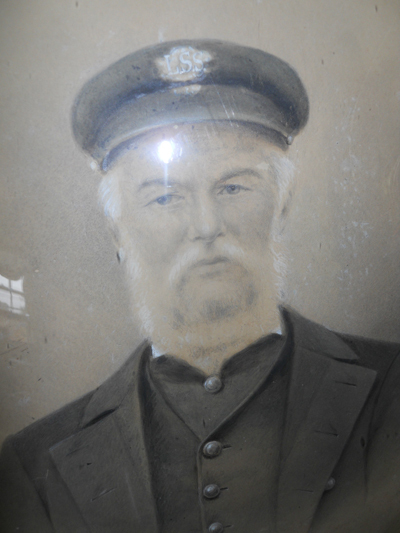 The Passaic Light came about largely because of the urging of Mr. Nerney, at the time a local pilot and former sea captain. Nerney convinced Congressman Dudley S. Gregory of Jersey Cityof the need for the lighthouse and $6000 was appropriated by Congress in 1847. Nerney would become keeper and would serve for twenty-one years. This was one of four light stations established during the nineteenth century to guide commercial shipping traffic through the crowded Newark Bay, warning vessels away from the spreading mudflats on the mouth of the Passaic River. The lighthouse here was a twin of the original Bergen Point Light, both stations being completed in 1849. 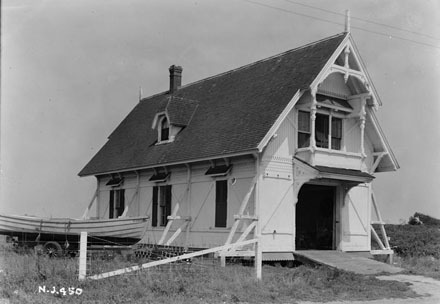 The original station consisted of a wooden tower on the roof of two-story wood-frame dwelling that stood atop a wharf. 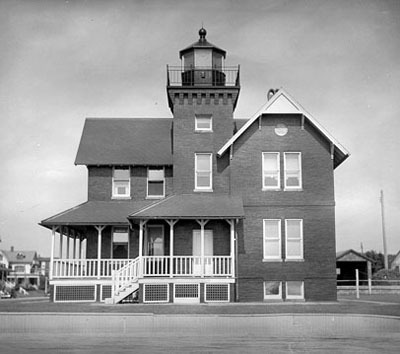 The lantern originally held a sixth order lens showing a fixed white light but like the Bergen Point Lighthouse, the building was so poorly constructed that it had to be rebuilt within a decade. The new 1859 lighthouse was a square tower built at the corner of a two-and-one-half-story keeper's dwelling, constructed on a new substantial stone pier. Nerney remained keeper and as part of his duties, kept track of the passing vessels, recording as many as three hundred in a single day. By the turn of the twentieth century, the river changed course, and shipping no longer passed near the light or the mud flats it guarded. It was abandoned shortly before World War I and eventually demolished. Also included is a copy photo of the light as it appeared in the 1880’s. Superb pieces on this early New Jersey light station would make an exceptional addition to any collection or display. Sold as a lot. (VG+). $178. 22297e. [ Massachusetts Humane Society] THE LATE DISASTROUS STORM ON THE MASSACHUSETTS COAST – SCENES AND INCIDENTS. 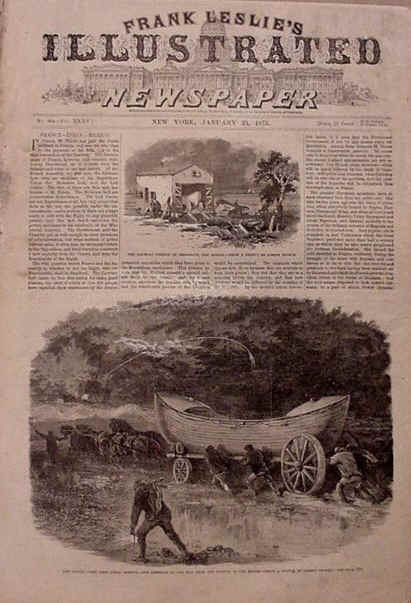 Frank Leslie’s Illustrated Newspaper. December 8, 1888 . 1 page 10 ½´x 16” . Beautiful, bright, hand colored, this is certainly one of the best views that I have yet found and one of only a few depicting the men and equipment o f the Massachusetts Humane Society. Large full page illustration includes the Humane Society surfboat and beach apparatus cart in front of the boathouse at Marblehead , Mass. A sign above the boathouse door reads “Massachusetts Humane Society”. 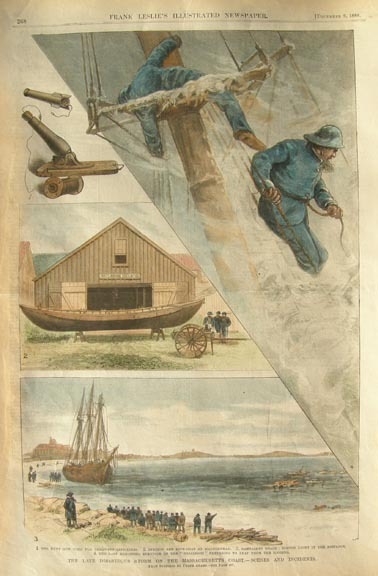 Additional illustrations include the Hunt gun and projectile, a vessel ashore on Nantasket Beach , and a view of the last remaining survivor of the Higginson preparing to leap from the rigging. Additional large illustrations include bodies ashore at Scituate after the disastrous 1888 storm, a similar scene of the destruction near the Highland Station on the New Jersey coast. 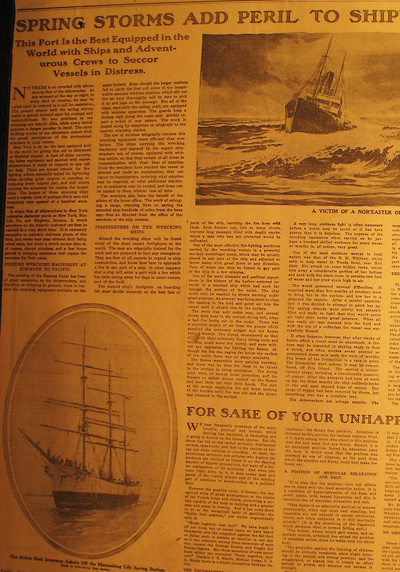 Includes a ¼ - page article describing the ferocious “Portland Gale” and the havoc wrought. Extremely difficult to find and would be superb matted and framed. Beautiful coloring and wonderful for display. Clean, crisp, only light age toning to margins. (VG+) $84. 25147c. 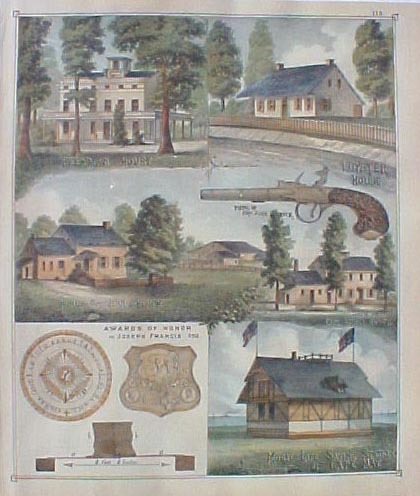 (New Jersey coast lithograph print.) c. 1878. 1 p. Disbound. Beautiful, hand colored , vintage antique 1878 lithograph print, from the very rare Woolmand and Rose Atlas of the Jersey Coast , published in 1878. Prominent is the close view of the early Life Saving Station at Cape May, and the Award of Honor made to Joseph Francis, inventor of the metallic life-boat which saved so many lives from shipwreck. In Addition are views of the Beekman House (located in Middletown ), the Luyster House, also in Middletown , the home of Capt John Schenck and his Pistol, and the house of Capt. Joshua Huddy. Beautiful coloration, large format 11 ½” x 14”, perfect for framing. (F-). $48 net. 2584a,b. THE LIFE-SAVING SERVICE. Frank Leslie’s Illustrated Newspaper. January 25, 1873. Detailed and interesting half-page article contains two beautiful engravings of the Life-Saving Service from the Seabright, New Jersey station in action. A wonderfully detailed half-page engraving depicts the surfmen, with the aid of horses, pulling their lifeboat along the beach toward the distress flares from a wreck beyond. 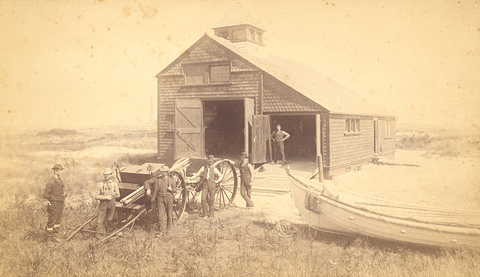 A second smaller engraving shows the surfboat and carriage in the small lifeboat station at Seabright , New Jersey . Full issue, overall clean, light edge wear, very nice for framing. (VG). $48. 8230d. FISHING OFF BARNEGAT LIGHT-HOUSE, NEW JERSEY. 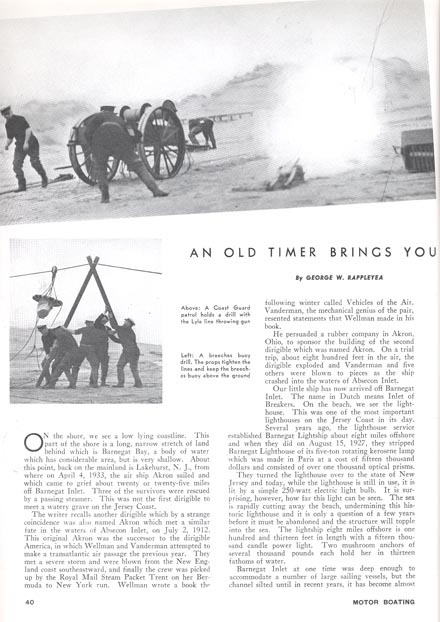 Appleton’s Journal. June 24, 1871. Superb front page engraved illustration showing scores of fishermen in the bay, with the tall tower of Barnegat Light-House behind. This large 6 ½" x 6 ½" b/w engraving is extremely fine and detailed. Combined with the ornate masthead above, this will be lovely matted and framed. Clean, slightly brittle, few small chips to margin. (VG-). $22. 2116. na. THE LIFE SAVING SERVICE. Frank Leslie’s Illustrated Newspaper. February 1, 1873. Beautiful early full page (11"w x 16"h), with two large views of the Life-Saving Service in New Jersey launching their lifeboat into the surf. Two large engravings detail the large lifeboat with the crews unloading from the carriage and launching into the surf. Lengthy article details the fledging service and the work of Mr. Kimball, as well as a few wrecks and equipment proposed. Most desirable engravings and article done during the Life-Saving Service’s infancy. Illustrations with article only, 2p., margins chipped. (G). $34. 11259. (lot 3 copy photos) New Jersey Light Stations c.1880-1908. 8” x 10” b/w, from National Archives images. 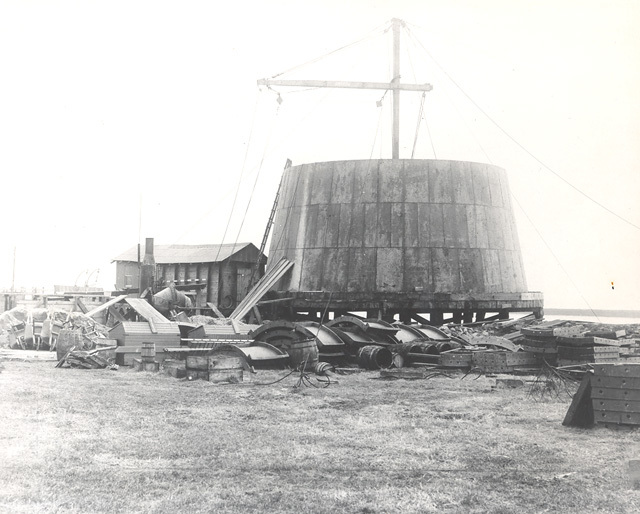 Stations include: Miah Maull Shoal (2 construction photos, one shown above), Finns Point Front Range Light. Great views, clear, crisp. Views are mostly from National Archives images dating from 1880-1908. $14 each or lot of 3 copy photos $18. 9336. [video tape] THE COAST GUARD IN THE 1930’S. Great original film footage produced in 1937 shows the early Coast Guard performing its daily duties. The film is divided into four parts, from a promotional film produced in 1937: The Story of the Coast Guard, The Coast Guard Academy, Service Afloat, and Service Ashore. Early footage includes early cutters, 34’ motor lifeboat underway in heavy seas, taking a vessel in tow during a storm, aerial views of beach stations, firing the Lyle gun and breeches buoy rescue from a vessel ashore, taking men off a burning tanker, pulling surfboats and lifeboats underway, early sea planes, laboratories and maneuvers at the Academy, patrol boats and cutters, flood of 1927, 78-foot patrol boats, capturing rum runners, beach patrol, New Jersey shipwrecks, and much more. Running time is approximately one hour. Great early views, all from original 1920’s-30’s original film footage and narrated, give a little seen view of our early Coast Guard. $29.95. 142d. Lighthouse Service. LIST OF TOWERS, BEACONS, BUOYS, STAKES, SPINDLES AND OTHER DAYMARKS IN THE THIRD LIGHT-HOUSE DISTRICT. 1879. Wash. 1879. 68 p. Soft wraps. 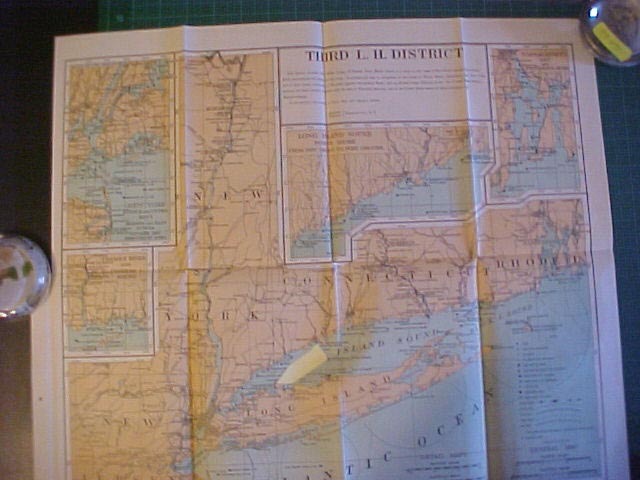 Includes all of the coastline of the Third Lighthouse District from Warren Point, Rhode Island to a point opposite Shrewsbury Rocks, New Jersey including Lake Champlain and Lake Memphremagog including Narragansett Bay, Long Island Sound, Gardiner’s Bay, Newark Bay, Mew York Bay, Hudson River, Fire Island Inlet and Rockaway Inlet. Includes descriptions of lights and light vessels, buoys, fog signals as well as other important information. Includes location, height above water, distance seen, candlepower, description of structure, and more. Some soiling and chipping to wraps, some foxing, contents unusually clean and intact. Very difficult to find these early lists and well worth the search. Excellent resource. (VG-). $88. PA-17. Lighthouse Service. LIST OF BEACONS, BUOYS AND DAY MARKS IN THE THIRD LIGHT-HOUSE DISTRICT. 1899. Wash. 1899. 145 p. Soft wraps. Includes all of the coastline of the Third Lighthouse District from Warren Point, Rhode Island to a point opposite Shrewsbury Rocks, New Jersey including Lake Champlain and Lake Memphremagog. Includes descriptions of lights and light vessels, buoys, fog signals as well as other important information. Includes location, height above water, distance seen, candlepower, description of structure, and more. Some soiling and chips to wraps, contents overall clean and intact, tight. Very difficult to find these early lists and well worth the search. Excellent resource. (VG-). $44. 6332-10. Lighthouse Service. LIST OF LIGHTS, BUOYS AND DAYMARKS IN THE THIRD LIGHT-HOUSE DISTRICT. 1907. Wash. 1907. 181 p. Soft wraps. Includes all of the coastline of the Third Lighthouse District from Warren Point, Rhode Island to a point opposite Shrewsbury Rocks, New Jersey including Lake Champlain and Lake Memphremagog. Includes descriptions of lights and light vessels, buoys, fog signals as well as other important information. Includes location, height above water, distance seen, candlepower, description of structure, and more. Only light soiling to wraps, contents unusually clean and intact, tight. Very difficult to find these early lists and well worth the search. Excellent resource. (VG). $128 net. 27154c. Lighthouse Service. LOCAL LIGHT LIST NEW YORK AND APPROACHES. Narragansett Bay to Cape May. Third Lighthouse District. Wash. 1930. 248p. Soft wraps. Covers the coast and harbors from Naragansett Bay , Rhode Island to Cape May , New Jersey . Includes descriptions of lights and light vessels, buoys, fog signals as well as other important information. Includes location, height above water, distance seen, candlepower, description of structure, and more. Overall in unusually good condition for an early list, covers nicely intact with only light wear, contents clean and tight, a very good copy. Very difficult to find these early lists and well worth the search. (VG+) $26 net. 27154f. Lighthouse Service. LOCAL LIGHT LIST NEW YORK AND APPROACHES. Narragansett Bay to Cape May. Third Lighthouse District. Wash. 1933. 250- p. (VG+). $26. 27154g. Lighthouse Service. LOCAL LIGHT LIST NEW YORK AND APPROACHES. Narragansett Bay to Cape May. Third Lighthouse District. Wash. 1934. 250- p. (VG+). $26. 27154h. Lighthouse Service. LOCAL LIGHT LIST NEW YORK AND APPROACHES. Narragansett Bay to Cape May. Third Lighthouse District. Wash. 1935. 253- p. (VG+). $26. 27154i. Lighthouse Service. LOCAL LIGHT LIST NEW YORK AND APPROACHES. Narragansett Bay to Cape May. Third Lighthouse District. Wash. 1936. 261- p. (VG+). $26. 24163. Field, Van R. and John J. Galluzzo. 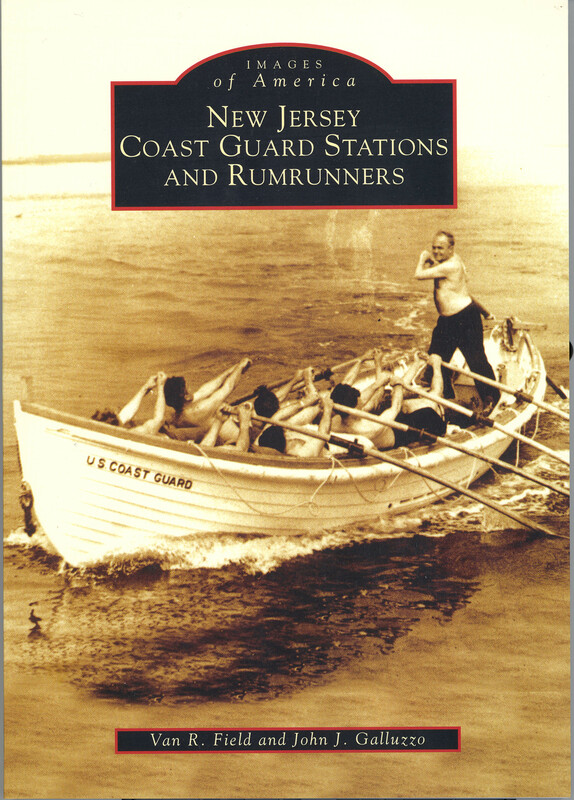 NEW JERSEY COAST GUARD STATIONS AND RUMRUNNERS. 2004. 128p. 200 vintage photographs. Published as part of the Images of America series by Arcadia Publishing. New Jersey ’s low-lying, sandy coast has been the scene of thousands of shipwrecks over the years as ships bound for New York foundered on its offshore shoals. Using a collection of over 200 early photographs dating from the early Coast Guard era, the well known authors paint a picture of early Coast Guard life, the work of the beach patrol, and much more. Filled with superb images of the early stations and their crews, surfboats and much more. Well done, a fine addition to your library. (M). $19.99. 23517. Bennett, Robert F. LIFE-SAVING ALONG THE COAST, 1848-1871: Its New Jersey Beginnings And How It Expanded. Toms River. 2003. 288 p. Stiff wraps. Captain Bennett is an historical expert on the United States Life-Saving Service. He has authored two books, Surfboats, Rockets and Carronades, and The Sandpounders (both published by the USCG); and has revised the Coast Guardsman's Manual (Seventh Edition). Captain Bennett has written numerous pamphlets and articles on the Life-Saving Service, and is frequently cited in materials written about it. This new presentation includes a reprint of Surfboats, Rockets and Carronades, originally published in 1976. 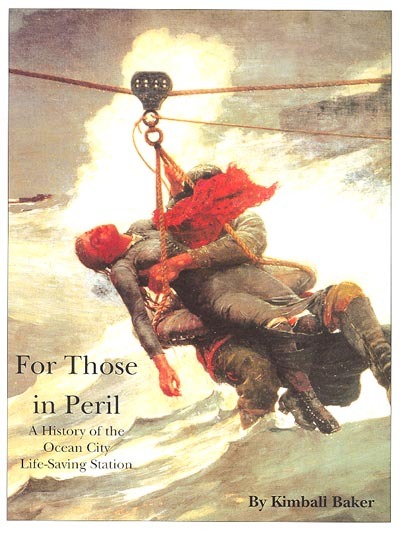 Written before the resurgence of interest in the origins of the Life-Saving Service, Surfboats, Rockets, And Carronades traces the little known origins, successes and failures of the earliest federal efforts in lifesaving along the coasts. During the years from 1848 through 1870 volunteer efforts of private citizens saved countless thousands of lives from shipwreck. To help them, they had only native experience, abundant courage, and some token federal assistance in the form of … SURFBOATS, ROCKETS, AND CARRONADES. This is the story of these first rescue stations and of the later establishment of the Life-Saving Service. Also includes is an extensively researched chronological presentation of official correspondence and documents relating to the funding and creation of the early life-saving stations. This chronology discloses the tools and equipment provided for the federal government, the early station-keepers and other important officials which gradually allowed the development of a nationwide organization admired throughout the world. A "must" for the Life-Saving Service historian and good reading for all. (M). $59.95. 22512. DeWire, Elinore. LIGHTHOUSES OF THE MID-ATLANTIC COAST – Your Guide to Lighthouses of New York, New Jersey, Maryland, Delaware and Virginia. Stillwater. 2002. 160 p. A Pictorial Discovery Guide. DJ. 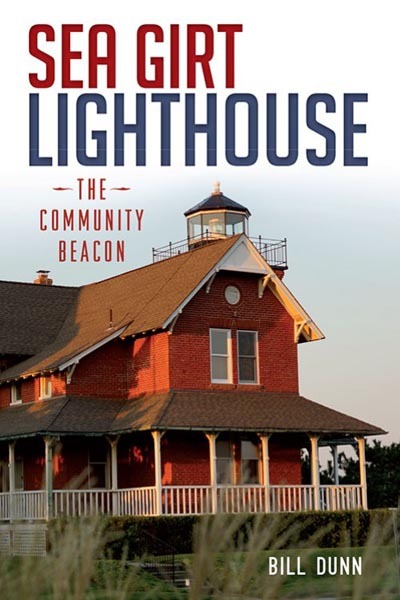 A fresh look at the history and technological evolution of lighthouses in the area, the development of apparatus, architecture, construction and maintenance on their remote sites, the daily life of the keepers and much more. The author presents an exciting history illustrated with stunning photographs, historical anecdotes, architectural details and local legends. Lavishly illustrated, an excellent text on the subject and guide for the area. (M). Hard Cover $29.95. 958. Morris, Paul C. and William P. Quinn. SHIPWRECKS IN NEW YORK WATERS A Chronology of Ship Disasters from Montauk Point to Barnegat Inlet from the 1880’s to the 1930’s. Orleans. 1989. 246p. DJ. The coastal areas of Long Island and New Jersey have been the scenes of untold numbers of shipwrecks and lost lives. Dangers lurked within the narrows and off Sandy Hook and many vessels were lost trying to enter or leave this famous port. Here, in over 250 fascinating vintage photographs famous authors Morris and Quinn bring these scenes into our homes. From groundings, collisions, fires and sinkings to extraordinary and spectacular incidents and the work of the life-savers, you won’t want to put this book down. Originally published at $34.95. (M). $29.95. 20207. 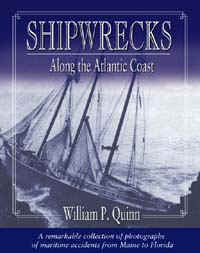 Quinn, William P., SHIPWRECKS AROUND NEW ENGLAND. Orleans. 1979. Soft wraps. 240p. Illustrated with over 350 photographs. The waters of the Northeast have claimed thousands of ships over the years. In this classic work, noted news photographer, historian and author Bill Quinn features hundreds of photographs of schooners and square riggers stranded, from the 1870’s to the 1970’s. from rock bound Maine down past the sandy shores of Cape Cod, through the sounds of Sandy Hook, New Jersey. With detailed text, the author describes numerous wrecks and the work of the Life-Saving Service and Coast Guard over the years. Includes the loss of the Monnt Blanc, General Slocum and Larchmont disasters, the City of Columbus, the Andria Doria, Normandie fire, and more. Exceptional reading. (M). $29.95. 10345. [Light-House Service District Maps]. U. S. Light-House Service. c. June 30, 1891. A rare opportunity to obtain an official U. S. Light-House Service District charts of all district aids to navigation as bound in their Annual Reports. Normally these charts are included within the Annual Reports and we are unable to offer them separately but we have found a lot of disbound charts in good condition. These are fine for matting and framing for your wall. Charts detail the entire Light-House District in three colors, and show all lighthouses, beacons, light vessels, fog signals, lighted buoys, Light-House Depots, and more. Charts average 8 ½” x 10” in size and are overall clean, may have very light stain, with only one light original fold, light age toning. A rare chance to obtain the chart of your District for framing. (VG). FIRST LIGHT-HOUSE DISTRICT. From the head of navigation on the St. Croix River , Maine to Hampton Harbor , New Hampshire . Includes all of Maine and New Hampshire . $44. SECOND LIGHT-HOUSE DISTRICT. From Hampton Harbor , New Hampshire to Elisha Ledge off Warren , Rhode Island . Includes all of Cape Cod, Nantucket and Martha’s Vineyard . $44. THIRD LIGHT-HOUSE DISTRICT. From Elisha Ledge off Warren , Rhode Island to and including a point on the coast of New Jersey opposite Shrewsbury Rocks. $44. PART OF THE THIRD LIGHT-HOUSE DISTRICT. Includes all of Lake Champlain . $18. FOURTH LIGHT-HOUSE DISTRICT. From a point on the coast of New Jersey opposite Shrewsbury Rocks to and including Metomkin Inlet, Virginia. Includes New Jersey , Delaware , Maryland and Virginia . $44. FIFTH LIGHT-HOUSE DISTRICT. From Metomkin Inlet , Virginia to and including New River Inlet , North Carolina . $44. SIXTH LIGHT-HOUSE DISTRICT. From New River Inlet , North Carolina to and including Jupiter Inlet Light-Station, Florida . Includes part of North Carolina , all of South Carolina , Georgia , and Florida between the limits named. $44. SEVENTH LIGHT-HOUSE DISTRICT. From a point south of Jupiter Inlet Light-Station to Perdido Entrance , Florida . Includes all of the sea and Gulf Coasts of Florida . $44. EIGHTH LIGHT-HOUSE DISTRICT. From Perdido Entrance , Florida to the Rio Grande, the southern boundary of Texas . Includes all of the Gulf Coast and lower Mississippi River . $44. NINTH LIGHT-HOUSE DISTRICT. Includes all of Lake Michigan, Green Bay and tributary waters. $44. TENTH LIGHT-HOUSE DISTRICT. Extends from the mouth of the St. Regis River , St. Lawrence River , New York to and including Grassy Island, Detroit River, Michigan. Includes the waters of Lakes Erie and Ontario , and the upper part of the St. Lawrence, the Niagara, and the lower part of the Detroit rivers. $44. ELEVENTH LIGHT-HOUSE DISTRICT. Extends from the Grassy Island Light Station, Detroit River , Michigan to the head of Lake Superior including the waters of Lakes St. Clair, Huron, and Superior and the upper part of the Detroit River , the St. Clair and St. Mary’s Rivers, and part of the Straits of Mackinac. $44. TWELFTH LIGHT-HOUSE DISTRICT. From the boundary between California and Mexico to the boundary between California and Oregon . $44. THIRTEENTH LIGHT-HOUSE DISTRICT. From the boundary between California and Oregon to the northern boundary of the United States and includes Alaska . Includes all of Oregon and Washington , and Alaskan waters. $44. 20178. [Light-House District Maps]. U. S. Light-House Service. c. 1900-1908. A rare opportunity to obtain an official U. S. Light-House Service District charts of all district aids to navigation as bound in their Annual Reports. Normally these charts are included within the Annual Reports and we are unable to offer them separately but we have found a lot of disbound charts in wonderful condition. These are perfect for matting and framing for your wall. Charts detail the entire Light-House District in three colors, and show all lighthouses, beacons, light vessels, fog signals, lighted buoys, Light-House Depots, and more. Charts average about 16" x 20" in size and are clean and crisp, with only light original folds. A rare chance to obtain the chart of your District, ideal for framing. (VG+). UNITED STATES. Outline Map shows all of the United States Light-House Districts with the more important lights noted. Includes all of continental United States and Alaska. $88. FIRST LIGHT-HOUSE DISTRICT. From the head of navigation on the St. Croix River, Maine to Hampton Harbor, New Hampshire. Includes all of Maine and New Hampshire. $88. SECOND LIGHT-HOUSE DISTRICT. From Hampton Harbor, New Hampshire to Elisha Ledge off Warren, Rhode Island. Includes all of Cape Cod, Nantucket and Martha’s Vineyard. $88. THIRD LIGHT-HOUSE DISTRICT. From Elisha Ledge off Warren, Rhode Island to and including a point on the coast of New Jersey opposite Shrewsbury Rocks. $88. PART OF THE THIRD LIGHT-HOUSE DISTRICT. Includes all of Lake Champlain. $44. FOURTH LIGHT-HOUSE DISTRICT. From a point on the coast of New Jersey opposite Shrewsbury Rocks to and including Metomkin Inlet, Virginia. Includes New Jersey, Delaware, Maryland and Virginia. $88. FIFTH LIGHT-HOUSE DISTRICT. From Metomkin Inlet, Virginia to and including New River Inlet, North Carolina. $88. SIXTH LIGHT-HOUSE DISTRICT. From New River Inlet, North Carolina to and including Jupiter Inlet Light-Station, Florida. Includes part of North Carolina, all of South Carolina, Georgia, and Florida between the limits named. $88. SEVENTH LIGHT-HOUSE DISTRICT. From a point south of Jupiter Inlet Light-Station to Perdido Entrance, Florida. Includes all of the sea and Gulf Coasts of Florida. $88. EIGHTH LIGHT-HOUSE DISTRICT. From Perdido Entrance, Florida to the southern boundary of Texas. Includes all of the Gulf Coast and lower Mississippi River. $88. NINTH LIGHT-HOUSE DISTRICT. Includes all of Lake Michigan, Green Bay and tributary waters. $88. TENTH LIGHT-HOUSE DISTRICT. Extends from the mouth of the St. Regis River, St. Lawrence River, New York to the mouth of the River Rouge, Detroit River, Michigan. Includes the waters of Lakes Erie and Ontario, and the upper part of the St. Lawrence, the Niagara, and the lower part of the Detroit rivers. $78. ELEVENTH LIGHT-HOUSE DISTRICT. Extends from the mouth of the River Rouge, Detroit River, Michigan to the westerly end of Lake Superior including the waters of Lake St, Clair, Huron, and Superior and the upper part of the Detroit River, the St. Clair and St. Mary’s Rivers, and part of the Straits of Mackinac. $78. TWELFTH LIGHT-HOUSE DISTRICT. From the boundary between California and Mexico to the boundary between California and Oregon. $88. THIRTEENTH LIGHT-HOUSE DISTRICT. From the boundary between California and Oregon to the northern boundary of the United States and includes Alaska. Includes all of Oregon and Washington, and Alaskan waters. $88. FOURTEENTH LIGHT-HOUSE DISTRICT. Extends on the Ohio River from Pittsburgh, Pa., to Cairo, Ill., on the Tennessee River 255 miles, and on the Great Kanawha 73 miles. $54. FIFTEENTH LIGHT-HOUSE DISTRICT. Extends on the Mississippi River from the head of navigation to Cairo, Ill., and on the Missouri River to Kansas City, Mo., and on the Illinois River from LaSalle to its mouth. $54. SIXTEENTH LIGHT-HOUSE DISTRICT. Extends on the Mississippi River from the head of navigation to Cairo, Ill., to New Orleans, La., and on the Red River. $54. LIGHT-HOUSE CHART. Includes West Indies between the Mona and Virgin Passages comprising Puerto Rico and dependencies, and all of the Hawaiian Islands. $38. Page updated September 19, 2018 .